For love of sport, Maria grew up as Changez Khan! Maria Toorpakay Wazir, respectfully called ‘Maria baaji’ by her teammates, smiles and laughs easily. When you ask questions, she answers in Urdu or English, she’s polite, respectful. Saurav Ghosal has gone where no Indian, male or female, has gone before – into the final of the Asian Games squash event. Sania Mirza reached Incheon yesterday, after winning the women’s doubles title with Cara Black at the Pan Pacific Open in Japan. She was at the courtside today, encouraging the women’s and men’s teams in their respective matches. Roger Federer will make his first trip to India this year to enthrall his legion of adoring fans when he plays in the Mahesh Bhupathi-promoted Indian Premier Tennis League (IPTL). Abhinav Bindra says that he has started to love shooting “only now”. And now he’s giving up professional shooting. Sounds strange — how can he give up shooting and still want to compete at the Rio Olympic Games? It’s a joke, isn’t it? Bindra won’t tell. The process of mastering shooting isn’t very enjoyable. It’s quite likely that after a lifetime of obsession with shooting, he actually wants to just enjoy the sport he loves. Shooting can’t be loved in the way a footballer actually loves playing football, or a tennis player loves playing tennis. This is clear from Bindra’s book, ‘A Shot At History: My Obsessive Journey To Olympic Gold’. Two days ago, this writer asked him if shooting was actually such a joyless sport as it appeared from his book. Bindra has seemed quite relaxed over the last few days — he actually grins and waves and smiles when he catches your eye. He exhibits his droll humour, his wit, his one-liners at very frequent intervals – this uncalled for jollity is quite alarming. Bindra, a famously inexpressive, undemonstrative, shooting machine, has seemed uncharacteristically relaxed. This has given rise to the opinion that something is not quite right – Bindra doesn’t do humour, you know. But maybe something is very right with him, after a lifetime of obsessive ardour for shooting. Shooting doesn’t love you back — it’s an unthrilling sport, it doesn’t thrill its practitioner like, say, swimming or cricket or hockey do. Shooting stunts feeling — it keeps a tight lid on the shooter’s emotions. Feeling is an enemy — it makes the pulse race, and that shakes the hand. Feeling is bad. It’s only after a tournament that a shooter can relax — and only a medal makes a shooter happy. Bindra’s compulsive pursuit of perfection in shooting made him the first Indian to win an individual gold medal in the Olympics. Did his obsession also drive the joy away from shooting? Seems likely, but only Bindra knows if that happened. 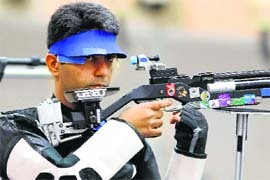 Bindra might well cut down his training to twice a week, but if he wishes to make it to the Rio Olympics in 2016, he would have to go through the rigorous selection policy of India’s shooting association. He’d have to compete in the Shooting Nationals, come through the selection trials. Will his twice-a-week training regimen be enough for him to remain India’s best? Time will tell. But it just might help him reclaim the joy of shooting. But when she gets into the court, she fights like a tigress. She’s had to fight like a tigress right from the start — like a tiger, actually. Maria got into sports in the garb of a boy, because girls couldn’t do sports where she was born. Maria, full of grit — and some grace — was born towards the end of 1990, the year after the Soviets exited Afghanistan. This soon led to a period of ceaseless turmoil on both sides of the Pakistan-Afghanistan border. Maria, living in Waziristan, was oblivious to all that. She was the girl of a family that had four boys. When she was 12, the family moved to Peshawar — everyone thought she was the fifth son of the family. One day, fighting with boys, she hurt her head. Her father, clearly a remarkably emancipated man, took her to a weightlifting coach. He told the coach that he wanted his son, Changez Khan, to train with him. Maria started weightlifting as a boy and, a couple of months later, she won a boys weightlifting championship in Lahore. But some boys around her used to play squash. Maria loved the court, the competition, the kit and the racquet. She decided she’d be a squash player. “My father was very happy with this decision,” she says. They went to the famous Hashim Khan Squash Academy. Dad tried to pass off Maria as a boy here too, but they had to register her, provide a birth certificate. The director of the academy, when he learnt of the girl desperate to excel in squash, was delighted. He kept her secret, allowed her to train as a boy, and gifted her a racquet — a Jonathan Power brand racquet. A month later, he decided it would be all right to let everyone know that Changez Khan was, in fact, a girl called Maria. The outing didn’t lead to the celebration of a girl’s unfettered love for squash. She was the only girl in the academy — she couldn’t play with the boys. She played on her own, without an opponent. She’d watch the boys play, then she’d shut herself in the squash court and hit the ball for hours, imitating their style. The family wasn’t rich, so she’d pick up the old balls thrown away by the boys, glue them into shape, and smash them again. She played with broken racquets and torn shoes. Maria wrote to squash academies around the world, but no one answered. Then she got an email from Canada, from a squash player/coach called Jonathan Power — the same Jonathan Power whose branded racquet she’d been gifted in Peshawar! Power was moved by Maria’s story — he decided to get her to Toronto, to his academy. He decided he’d be responsible for her career and development as a player. At 16, she'd been third at the junior World Junior Championship, and that had convinced Power of her potential. Her mother had told her that “tumhe Allah ke naam par bhej rahe hain”. At the airport, Power came to receive her — he saw a wild-eyed, anxious girl with a squash bag. He simply picked up the bag and took her to his academy. Maria now is a confident, talkative young woman. She’s ranked No. 63 in the world, though her highest was No. 41 in 2012. In her story, though, the numbers are irrelevant. What matters is her strength. Maria is a strong woman. She’s powerfully built, has strong legs and powerful arms, hits the ball hard, and flits around the squash court. But her real power is in the mind — an incredible mind. Ghosal, who’s won two bronze medals in the Asian Games, beat Ong Beng Bee of Malaysia 11-9, 11-4, 11-5 in the semifinals today. Bee had stung Ghosal in the 2006 Asian Games quarterfinals – Ghosal had his revenge today. Ghosal was electric today, dominating a high quality thriller. The two last played three months ago, when Ghosal lost to Bee in Hong Kong in four games. “I don’t have a very good record against him,” said Ghosal later. “I knew I had to play well and I strategised. He is strong in the front court so I tried to control it. I didn’t make too many mistakes either.” Squash must be won by pushing the opponent to the back of the court. Ghosal did it brilliantly, making Bee run across, to the front, to the right and to the left and, most crucially, to the back. He finished off the points decisively with angled drops that beat Bee, despite his lunges and stretches. “To put it simply, I was able to put him in spots behind me more than he could, and I could open spaces on the court and execute my shots,” Ghosal added. He did finish off the points with the drop, he said, but it was the work before that that was the key. 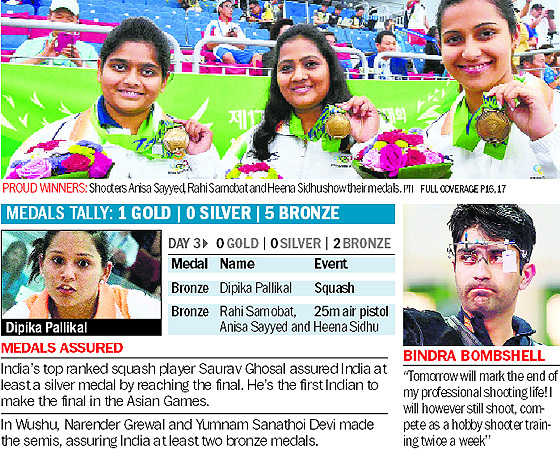 The shooting range once again provided an early medal for the Indian contingent as the women's pistol trio of Rahi Sarnobat, Anisa Sayyed and Heena Sidhu shot down a bronze in the 25m range on day three of the competitions on Monday. 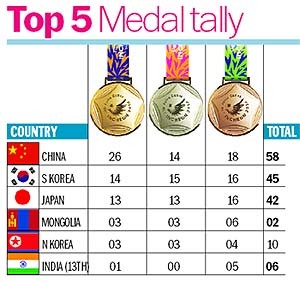 The Indian trio tallied 1729 points, a whopping 18 adrift of silver medal winners China and two more behind gold medallists and hosts South Korea, to clinch the fourth medal from the pistol and rifle shooting range here. Indian women’s hockey team started their campaign on a winning note by drubbing a lowly Thailand 3-0 in a one-sided Pool A match at the Asian Games in Incheon on Monday. Poonam Rani (15th minute), Vandana Kataria (39th) and Deepika (53rd) scored the goals for India at the Soenhak Stadium. India were today assured of at least two bronze medals in wushu with Thoudam Sanathoi Devi and Narender Grewal storming into the semifinals in their respective events on Monday. Sanathoi beat Amgalanjargal Sangidorj of Mongolia via 'Win By Round' (WBR) verdict in her 52kg category quarterfinal contest here today. Later, Grewal also outplayed his Pakistani opponent Abdullah in the men's 60kg quarterfinal contest in an identical 'Win By Round' (WBR) verdict. In the edition published on September 21, we've erroneously mentioned that Jitu Rai won a gold medal in the 50m air pistol event. The event is actually called 50m .22 pistol event. The error is regretted. Sania Mirza reached Incheon yesterday, after winning the women’s doubles title with Cara Black at the Pan Pacific Open in Japan. She was at the courtside today, encouraging the women’s and men’s teams in their respective matches. 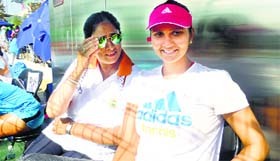 Sania was not in action — she will participate only in the doubles events of the individual category. She was relaxed and happy as she discussed India’s prospects at the Asian Games. You lost WTA ranking points by opting to play at the Asian Games. The important thing is that I’m here and focussed on this. I’m happy to be here, and I’d take this decision again if I have to. Is it difficult to motivate yourself when questions are asked about your commitment to play for India? No, not really. If it was difficult, I would not have been here. I don’t have any of those emotions any more. I’m not a negative person, I don’t live in the past. I’m very happy, and I’m not going to focus on the negative and the bad stuff that happened. You come into this tournament with good form. Yeah, I don’t think I can ask for a better form — the last three weeks have been amazing. But every tournament is different, especially an event like the Asian Games, in which a lot of emotion is involved. The male players have missed this event, so how do you motivate yourself to come to play here? I don’t need to derive inspiration from other people, I derive it from myself, my love of tennis. I’m here to play for India, and that’s really it. I’ve been in the Asian Games three times before and I’ve won six medals. I’m here again, and I’m happy it’s my fourth time. Despite all those medals, how do you find the motivation to come back? As athletes we’re very greedy — I don’t think we are ever satisfied, and we should not be. If you are satisfied, it’s time to hang up your boots. You have to want it, whether it happens or not is a different issue. For a change, you’re the most senior player in the team. That’s the scary part! In every Asian Games I’ve been to, I’ve been one of the youngest, this time I’m the oldest! All these girls are my sister’s age — and for me, my sister is a baby! She’s seven-eight years younger to me. All these girls have great potential, it’s definitely a stepping stone for them and it’s going to help them improve. The expectations are usually high from tennis at the Asian Games. We all are trying to win medals, but so are the other athletes who are here. These are the best players in Asia. Even if we don’t win a medal, this would be great for our girls. They’re 20, and by the next Asiad, they would be 24 and more experienced. Do little girls tell you that they started playing after being inspired by you? Yes, lots of girls do, and that’s what really keeps me going. It’s great to win medals, to be famous… But when those little girls come to me and say that ‘you’ve inspired us to pick up a tennis racquet’, that’s amazing! When you came up, there was a huge hope that a generation of girls would be inspired. I hope I’ve inspired girls. Unfortunately, we don’t have someone who has come up to the top-most level. I hope that changes. They’re coming closer, they are in the top-300 now, but we’ve still not had top-200, top-100 girls. Hopefully, that would happen soon. 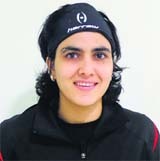 Nirupama Sanjeev became the first Indian girl to win a Grand Slam match in 1998. We seem to have come a long way since then. Now, when I win just one round, it’s treated like a failure — so yes, we’ve come a long way! Sometimes even the semis is seen as a failure! Yes! I came from the US Open, and the first question someone asked was: ‘Oh, but you went into the women’s doubles semis too, but could not win two titles.’I said, ‘Wow, I’d be happy to take one Slam!’ You guys in the media are greedy! But that’s all right. Certainly, the organisers have pulled off a coup by naming Federer as a replacement for an injured Rafael Nadal. Nadal has withdrawn from the four-team event, citing health problems. “When you are talking of profile as high as Rafal Nadal, there was probably only one name that could have helped ease the pain and for us. Fortunately Roger was available and we made it happen,” Bhupathi, IPTL's founder, said. Federer joins Pete Sampras, Ana Ivanovic, Gael Monfils along with India’s Sania Mirza and Rohan Bopanna in the squad. Bangalore: Chennai Super Kings (CSK) defeated Dolphins by 54 runs in a CLT20 encounter on Monday. Dolphins chasing down the huge total (242/6) only all out on 188 runs in 20 overs. Cody Chetly scored 37 runs while Cameron Delport scored 34 runs in the team total. Mohit Sharma picked up 4 wickets for CSK. New Delhi: The 2022 World Cup will not be held in Qatar because of the scorching temperatures in the Middle East country, FIFA Executive Committee member Theo Zwanziger said on Monday. "I personally think that in the end the 2022 World Cup will not take place in Qatar," the German told Sport Bild on Monday.